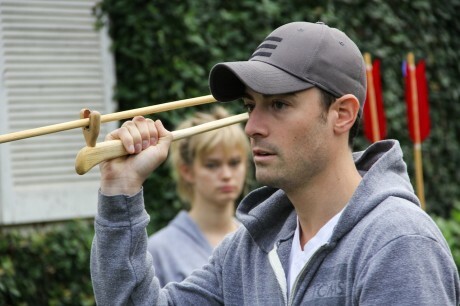 Last weekend, Reality Rush put on a “Big Brother” themed competition featuring celebrities including pop star Lance Bass, actress Jamie-Lynn Sigler, actress Sara Paxton, baseball player Cutter Dykstra, actor Zach Cregger, and more — as well as Big Brother star/winner Dan Gheesling and his wife, Chelsea. The event also featured several other Big Brother stars, including Mike “Boogie” Malin, Jeff Schroeder, Rachel Reilly & Brendon Villegas. One of the “Power of Veto” challenges featured Thunderbird Atlatls! 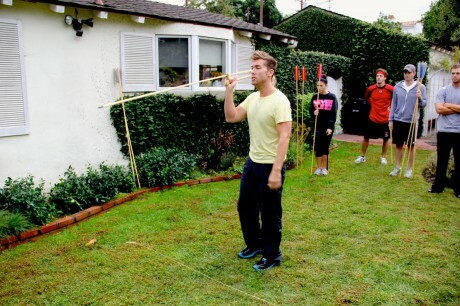 Here are some photos of the celebrities (including Lance Bass, Sara Paxton, Zach Cregger and Dan Gheesling) throwing our atlatls and darts. 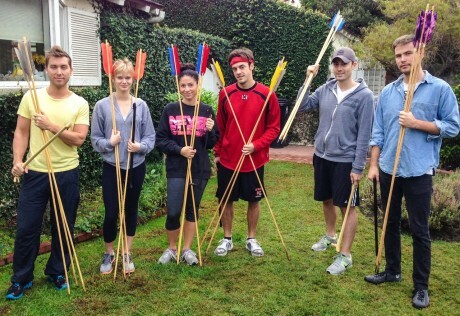 The celebrities had a great time playing and competing with the atlatls. 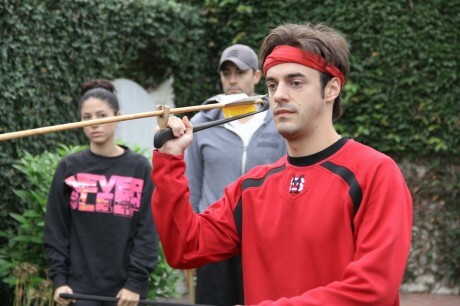 The ultimate winner of the atlatl challenge was Nick Todisco, who beat out Big Brother winner Dan Gheesling for the Power of Veto and managed to take him out of the game in the next round…so this was a crucial challenge in the competition! For more information about this event, or Reality Rush, please see this blog post about the game: EVICTION: Celebrity Edition. Pictures and stories were all over this week of a 10,000 year-old atlatl dart which showed up after an ice sheet melted near Yellowstone National Park. If you are ready to check out some newer atlatl darts, Thunderbird Atlatl has wooden and cane darts available in sizes ranging from five foot to seven foot. 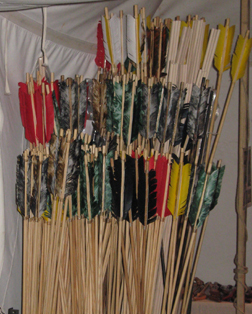 Darts are sold individually or in bundles of seven darts. It’s best to order at least three darts as shipping is based on length rather than weight and it’s difficult to ship one dart. You can order through our web page or give us a call at 800-836-4520 or try our cell phone at 607-743-4379. 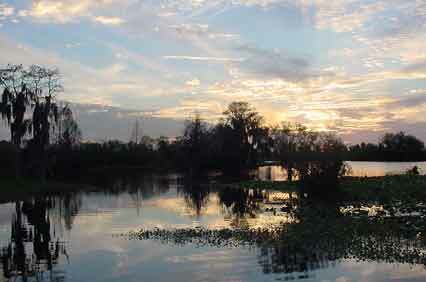 The sun turned the sky to brilliant red as it sank beneath the tree line along the western shore of the Rainbow River. In the evening calm the clear water was glass smooth. I held my atlatl and harpoon dart ready in hopes I would get a clear shot at a fish. We could see occasional ripples cross the water around us, telling of fast moving small fish attempting to escape the clutches of some of the larger predatory species. But the sun reflecting off the top of the water kept everything below the surface hidden from view. We talked for a while, waiting for the darkness to settle in. In the distance vultures coming in from every direction landed in a giant cypress tree that grew out of the shallow water of the flats. A symphony of alligators chortled in every tone belying their various sizes from small to very large. Earlier that day we had seen several large alligators sunning themselves on fallen logs. We weren’t here for alligators but anywhere you see gators you will see gar. 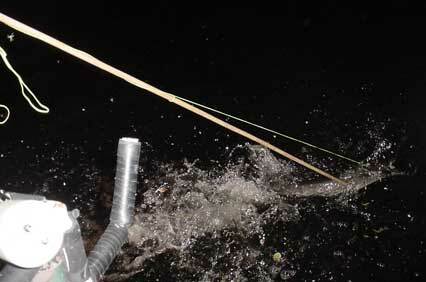 To spear gar with an atlatl you have to be able to see them well and they need to be in reasonably shallow water. At night with the Colman lanterns we have rigged to the bows of our boats you can see the gar as deep as twenty five feet swimming along like submarines barely wavering from their characteristic straight line course. 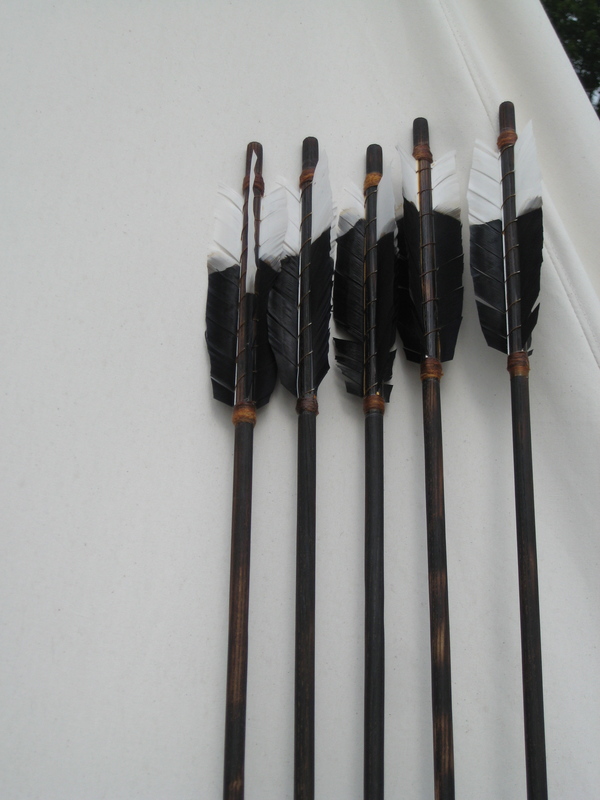 You can see the inverted crossbows that we just purchased, they are great bows. 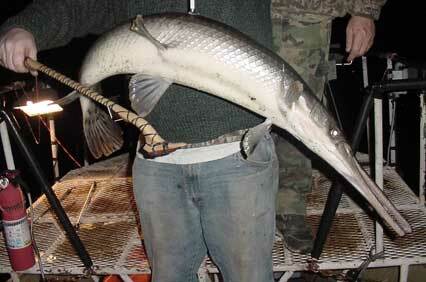 The skin of a gar is like armor with the texture of rough sandpaper. To get a dart through this you need sharp points and enough energy to break through a quarter inch of bone like skin. It can be done with a bow but the arrow looses energy much faster than a harpoon dart. 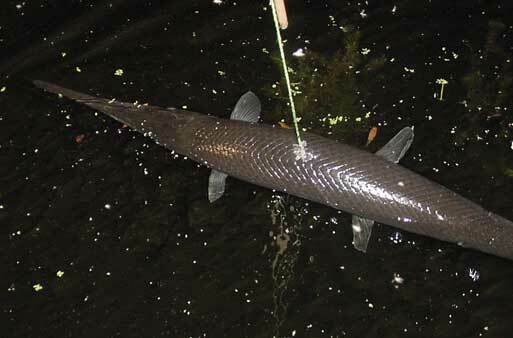 The added length and weight of the dart allow deeper penetration of the water, with enough energy left to penetrate the thick hide of the gar. Leggs spotted the first giant gar as we entered a lagoon. He was not ready for it but I was. I had to cast at just at the right time to make the shot. I hit it right in the middle of its five foot long body and it took off. I let the line go as it retreated until I had nothing left but the float at the end of my line. 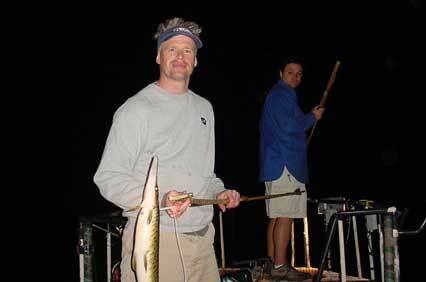 I hung on as the fish dragged the boat several hundred yards. As the fish tired I pulled it closer to the boat. Leggs, being the bravest of us gaffed it into the boat. It slashed with its razor teeth just scratching the back of Leggs’ hand. He stowed it under the deck where it could not hurt us after we took several pictures. It is an annual event for us to go to Florida in the middle of February to enjoy our atlatl adventures. We meet at Payne’s Prairie Campground where the annual Knap-in occurs. 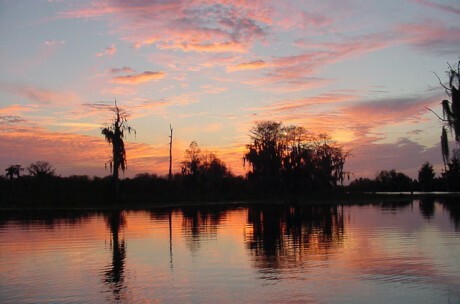 The park has great facilities and is perfectly situated for us to be able to go to the various places in North Florida to hunt and fish with our atlatls. Also Florida’s fish and game laws allow the use of the atlatl. The sun drops below the treeline. And first big gar, harpooned with an atlatl. Andy with his gar. That's Micah behind him. 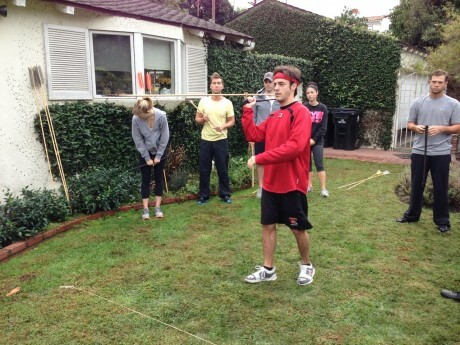 We got started early in the morning. We went out to the land we planned to hunt which is a parcel of several thousand acres along the banks of the Oklawaha River in the neighborhood of Ocala, Florida. We had our rifles and rangefinders in hand and ready to go. I was excited to try out the new long range rangefinder I just bought, read more about long-range rangefinders. The terrain consists of recently cut pine forest, cane break, and virgin cypress swamp, in roughly equal measures, depending on its elevation above the Oklawaha. The property is contiguous with tens of thousands of acres of similar land along the Oklawaha, offering incredibly good habitat for wild boar. There are also plenty of deer and other wild life in the area including black bear, which we were able to see two years ago in this same location. We have seen osceola turkeys, alligators, squirrels, and monkeys in this location. It was easy to imagine oneself in this setting to be back in the days when atlatl hunting was an every day event. Warm spring winds blew gently through the palmedows and cane. In the distance I could see a vulture in the tree tops drying its dew soaked wings, outstretched to catch the morning sun and breeze. I hunted from a ground blind that I had hastily constructed out of forest debris that morning in a relatively sparse part of the cane break. I heard the crackling of wild boar approaching though the dry thatch of dead palmedow leaves. I had been hearing them for a while. But they were now on the other side of the boundary beyond where we were allowed to hunt. My hope was that they would eventually come my way. Those gentile winds were, however, not blowing in the right direction. The swine started to put up a squall. I thought they must be fighting over something. I decided to go over and investigate.” The figured the worst thing that could happen is that they would run away. The squealing became more intense as I got closer. I don’t think they ever noticed me as I approached . The wild pigs were now about fifty yards behind my ground blind in a cane break thicker than the weave of a picnic basket. Atlatls don’t work that well in brush that thick, but you never know, you might get a shot in anyway. My heart pounded as I got closer. I bent to look under the palmedows and saw the first pig only twelve yards away. I was looking at him looking at me. The jig was up. That pig and the rest of the wild boar herd with it melted into the underbrush. The first sighting of wild boar was getting me excited about the hunt. We hunted for a few days without much action until one evening on the way out of the woods we encountered a herd of small wild boar crossing a logging road. Normally I don’t think I would have shot at such a small animal but predatory instinct got the best of me. I took a shot at fifty yards and connected— with a little fifty pound pig. I had to shoot the dart at a high angle to get it there. The fact that it hit was either incredible luck or a case of predatory instinct taking over my mind and body. In any case the little boar turned out to be the finest meat we had eaten in a while. Our next encounter with a boar was the next morning. We had made extensive plans the previous evening, which fell apart as soon as we reached the hunt site. The elusive wild boars were slinking into a large clear cut just as we walked up to it. We put our plans on the back burner and went to plan omega three. I started out by taking a shot at about thirty five yards but missed. I pursued the boars into the field, knowing Big Wooley and Leggs would get into action and form up a triangle around them. We had talked it over many times in the past about what we would do in a situation like this, so I knew I could count on them. As we closed the triangle in we knew that our quarry would have to go by at least one of us to escape. Leggs signaled me that they were coming my way so I crouched low behind some tall saw grass. They came out in two groups of three or four each. I stayed low until the first group went by. I had my dart knocked and laying against the back of my left hand which now held five darts. Those five darts were across my knees in the proper position for a quick reload. 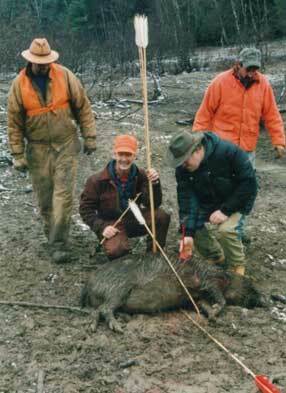 I stood up and chose the last of the first group of boars as my target. I shot, leading the running boar just enough. I hit it right behind the left shoulder. The dart drove the three inch flint point deeply into the vitals of the boar. The half inch ash shaft bent but did not break as the boar beat its final retreat toward the row of pines and palmedows. We even butcher the hogs we kill like cave men. We use stone blades knapped from flint blade cores that we carry in our pockets or leather pouches. At the hog hunt at Cold Brook three years ago the guides were amazed at the efficiency of our stone tools, but they are actually sharper than typical metal knives. A chill went up my back as I began to hear movement behind me in the pine thicket where I chose to conceal myself. In front of me was a sandy red dirt South Georgia road riddled with gullies carved in it by torrential downpours over the last few years. I knew from experience that the noises I heard were from several wild boar and that they would be crossing the road in front of me pretty soon. 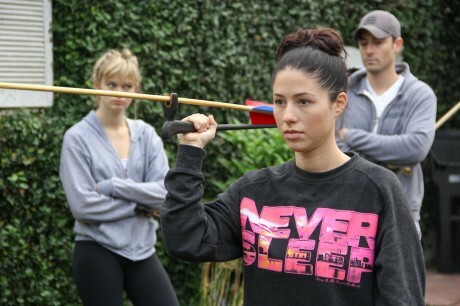 Could I move out there where I could take a better shot with my atlatl, without the hogs noticing me? I checked the wind and realized that those hogs already knew I was there. The wind was blowing directly from me to them. They must have been lying in the thicket since I got there two hours before, from the sound of it. Now they were just shuffling off at a quick pace to avoid me. Nevertheless, I carefully slipped out of my ground blind and brought up my dart, turning just in time to see the last big hog disappear from view on the other side of the road. I was a second too late to shoot. Oh well, at least I got to see one. A while later Mark came up the road with a somewhat frustrated look on his face. His account of the evenings proceedings was much the same as mine. He told me that he thought it might be just about impossible to ambush a boar in these thick southern yellow pine woods. I agreed with him as we set off for his van. 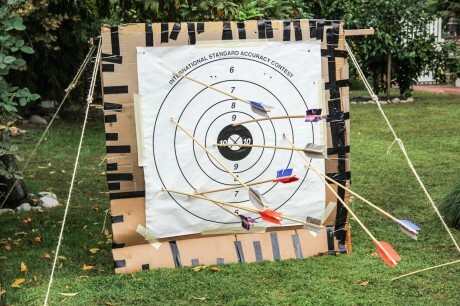 Next time we need to get a little altitude in order to get a clean shot especially if we are going to use atlatls which have a range limited to about 20 yards in the open, with any accuracy. We also need to place ourselves between the hogs bedding area and their food recourses, yet in an area that is somewhat clear. A clear area in these parts is unusual. Unless someone has made a clearing such as a greenfield, you may not find such a thing in the South Georgia forest. You need to take advantage of open spots such as dirt roads, streams or those rare places under the canopy of hardwood trees. I think I would like to try a tree stand in a hardwood tree next time I go.